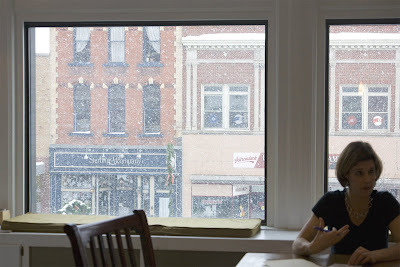 Nothing like working in a snowglobe to bring out the creative*. New York City-based Slurp & Burp® has developed a new product with a patented design that allows a mom to nurse discreetly without covering her baby. Michelle Reder, the inventor and entrepreneur behind the effort, came upstate to Trampoline for help with a name and identity. 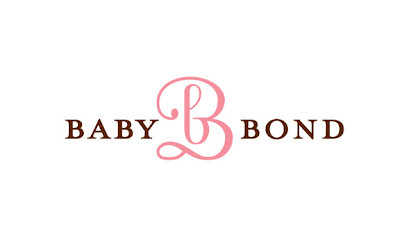 After three rounds of suggestions, BabyBond emerged as the favorite. Luckily, there are two nursing moms and a talented seamstress on the account. 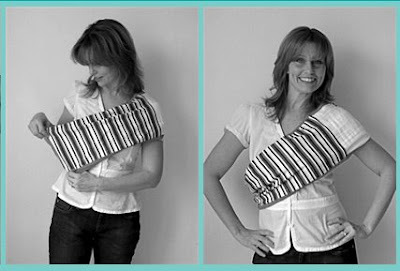 The BabyBond is a loop of layered cotton material that is worn like a sash over one shoulder of the mother and under her opposite arm- please refer to wearing instructions. 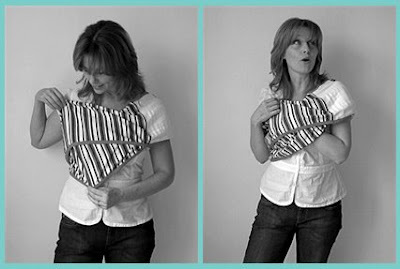 The patented design allows the mother to be covered and the baby to be uncovered. 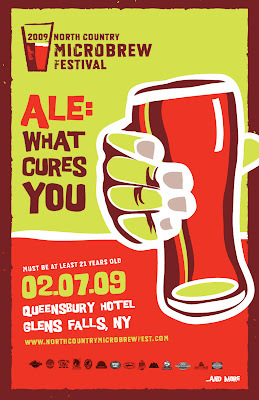 I donated back to the Hospital and all I got was this, um...actually, wait. I might just wear this. 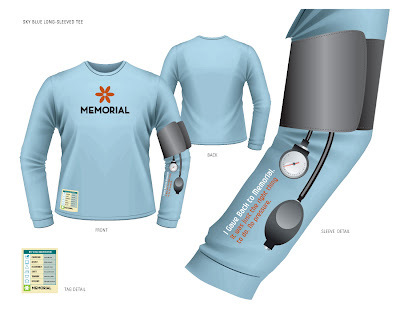 The Development staff at Memorial Hospital in WA asked us to develop a series of Tshirts for their employees who donate a portion of their income back to the organization. 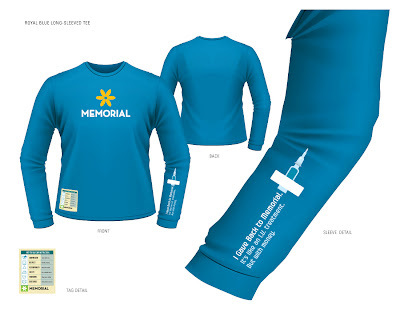 They had three criteria: The shirts needed to be blue, to reinforce Memorial's internal Into the Blue initiative. They asked for long sleeves, so that nurses could wear them under scrub tops. And they had to be, well, good enough to actually get worn. January can be a grizzly month; with potent holiday hangovers, gray forecasts and general blahness pervading the workplace. Not so, here at Trampoline. 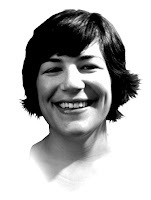 We're heralding the new year with a fresh hire, a sweet return and a natural evolution. Fresh to the Trampoline team is the seasoned and sensational Mike Sylvia. An accomplished photographer, designer and strategist, Mike has been hired as Creative Director. Officially just two days in and he is already handling accounts and clients with ease and finesse. His handling of the rest of the staff is as if he's always been with us: helpful, sincere and wickedly sarcastic at just the right moments. 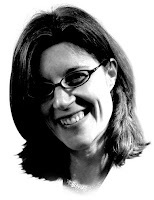 Not to leave anyone out, we must also note the return of Amy Stevens from maternity leave. While we're all proud of what we managed in her absence, she takes the cake for her exquisite daughter Ellie, not to mention the speed at which she has jumped back into things taking on The Sagamore, Slurp and Burp and a few of our own little things. 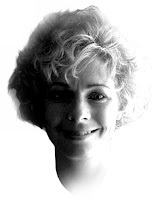 Amanda will continue to copywrite and manage accounts, but will now be handling new business development. She'll also continue to cultivate infamy for bounding up the stairs loudly and running to every appointment. Next up: the completion of our new website, some exciting prospects, and more of our trademark Trampoline creative.